He is often seen together with Taishaku Ten as a protector of the Land Japan. A major Hindu deity thought to be responsible for creating the world. Along with Taishakuten 帝釈天, he appears as a protector of the historical Buddha Shaka 釈迦, from earliest times. The pair are shown in scenes from the Buddha's life, particularly administering his first bath, and in triads, sanzonbutsu 三尊仏, where Bonten usually appears as an ascetic and holds a lotus. 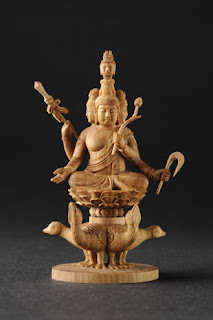 However, they came to be seen as general protective deities and in the Nara period frequently were placed on the dais to either side of the main figure. Bonten's special role in the Buddha's life was in persuading him to teach after he had become enlightened. 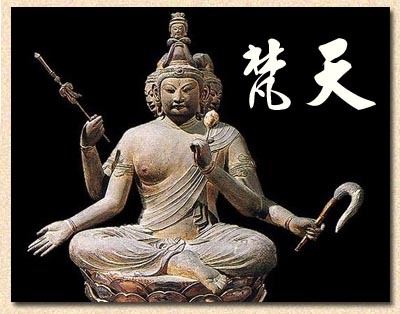 In Japan his attributes are not fixed, and Bonten and Taishakuten may be differentiated only slightly by dress and by mudra that mirror each other. It is only as an esoteric figure that his iconography is truly distinctive. Bonten had no independent cult in Japan but is always shown either with Taishakuten or as one of the Twelve Deities juuniten 十二天. Well known images include the Nara period set in the Hokkedo 法華堂 (Sangatsudou 三月堂) of Toudaiji 東大寺 in Nara, where, according to temple tradition, the sculpture to the left of the main image, Fukuukenjaku Kannon 不空羂索観音 is Bonten. This figure is shown wearing armor under his robe, which may suggest that he is Taishakuten, who, in India, may be shown as a martial figure. On the other hand, in several paintings in Japan the figure to the left of the main deity (Bonten's proper place) is also shown in armor. In the Hokkedo set, the two are shown wearing robes from the Tang dynasty and are close in appearance to bodhisattvas bosatsu 菩薩. Other well known images include the pair from the Nara period in the Kondo 金堂 of Toshodaiji 唐招提寺. The most striking image is the early Heian pair in Toji 東寺, which captures Bonten as he appears in the outer court of the Taizoukai mandara 胎蔵界曼荼羅 with four heads, a third eye, and four arms. In addition, he rides on a lotus platform supported by four geese (the goose is his vehicle; it is a symbol of knowledge and its name has the same sound as a word in his mantra). He is dressed in the usual robes of a bosatsu and holds a fly whisk, a lotus, a staff, and has one palm turned out.
. Bondeko ぼんでこ fertility stick . Teams of young men race to the shrine Taiheizan Miyoshi 太平山三吉神社 carrying bonten (or bonden in the local dialect). Bonden are sacred symbols of masculinity, 3m (10ft) long, and colourfully decorated with the animal symbol of the year. The race is to be the first team to dedicate their bonden at the shrine and pray for a prosperous year. guards the upward direction; Hindi deity who created the universe, with four heads for overlooking each of the four directions (although often shown with only one). Also known as the universal soul, in contrast to the individual soul (atman). Bonten’s “vahana” is the wild goose. (4) help them abandon attachment to love and hate to become impartial to all. One can attain rebirth in the Brahma Heaven, it is said, by practising these virtues. Bonten lives in the first of four meditation heavens, in the world of form, above Mount Sumeru; said to rule the “saha” (Sanskrit word for endurance and for the world of suffering); people in the saha world endure many sufferings caused by desire and three poisons -- greed, anger and foolishness.
. Yamagata Festivals 山形県の祭り . A rite held February 1–2 at Kasuga Shrine in Kushibiki Township, Higashi-Tagawa District, Yamagata Prefecture. The deity Bonten (Skt. Brahmadeva, originally a Vedic deity appropriated at an early stage of Buddhism as the ruler of the realm of desire in which our world of Saha exists) in this festival takes the form of a large, skeletal fan and is called Ōgisama (A pun-filled appellation, ōgi is written with characters that mean "the king of paper," the word for "paper," or kami, being a homophone of that for "deity"; ōgi itself is a homophone of the word for a kind of paper fan, while sama is an honorific.). 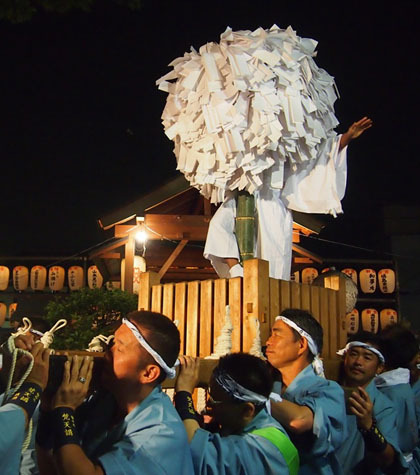 After being welcomed by the festival supervisors (tōya), Ōgisama is placed in the shrine and nō performances are held before him the whole night through. 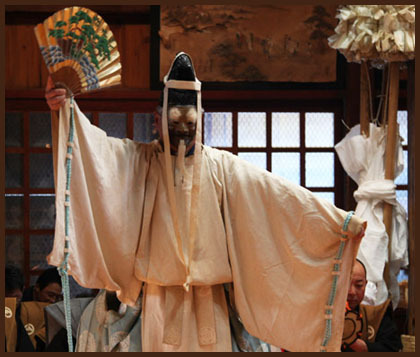 This nō is known as Kurokawa nō.
. Kurokawa Noo 黒川能 (くろかわのう) Kurokawa Noh . a long ritual pole with paper streamers attached to its upper portion. During some rituals paper flowers are also attached to it. Usually a male symbol connected to prayers for a good harvest and fertility. Bonten togyo 梵天渡御 "Bonten is passing"
. Agata matsuri あがた祭り / 県祭 Agata Festival . 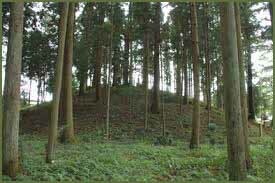 A Kofun tomb in the form of 前方後円墳, circular shape with a rectangular frontage, the front part facing West. This story dates back more than 300 years. At the tea stall of the pass 十曲峠 Tsuzuraore Tooge, a special "Fox Medicine" is sold. 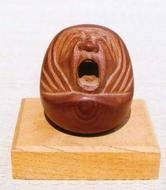 Legend knows that its contents were explained the the owner (of the Matsuzaki family 松崎家) by a fox who lived near a Secret Rock at the mountain called 梵天山 Bontenyama. When the owner of the tea stall was thinking about helping travellers with pain in their legs, he had a dream about a fox telling him how to make the medicine, says another version.
. Yamanaka Yakushi 山中薬師 . In the year 708, the Imperal Court gave the order to the governor of Oshu to search for 銅鉱bronze ore. At the foot of 大盛山 Omoriyama people saw a strange being, almost like a lion, coming down from the sky. This being made a ritual Bonten pole and threw it down the valley. Where it landed, they found a lot of bronze. In the year 1616 the third son of Lord Date Masamune, Date Munekiyo 伊達河内守宗清 (1600 - 1634) was forced to live in Yoshioka 吉岡, where he also built a castle to live. Once he went fishing for Oogai オウガイ漁 to river Yoshidagawa 吉田川. On his way back home he met a priest claiming he was the messenger of Bonten. Half in joke Munekiyo handed him the box with the raw-smelling fish, but the messenger refused. So the Lord got angry and killed the messenger. Soon he was cursed with illness and died young at age 35. Later the messenger-priest erected a stone memorial of Jizo on his grave to appease his soul. People with ear diseases come here and offer a 竹筒に甘酒 bamboo container full of sweet rice wine to get healed.
. kenka matsuri 喧嘩祭 "fighting festival" . at 船形山 Funagatayama, Kagamigaike 鏡ヶ池 the "Mirror Pond"
During the time of the Emperor Jomei 舒明天皇 (593 - 641) there lived an evil demon at 葛城山 Mount Katsuragisan, who ate all the crops and devoured even babies. To expel this demon, people prayed to their local deity 氏神大梵天. This Dai Bonten 大梵天 made strong rain fall, took 弓矢 bow and arrow, bamboo spears and drove the devil out of the region. At the temple 延命寺 Enmei-Ji this bow and arrow are kept as treasures to our day. 静岡県 Shizuoka 静岡市 Ryuugeji 竜花寺 Ryuge-Ji "Dragon Flower Temple"
. Ryuugeji 龍華寺 (竜花寺) Ryuge-Ji . oobito 大人 "a huge person"
A huge person had come down from the sky and in one night straightened the wild land and made the area inhabitable for humans. The villagers were overjoyed and build a large sanctuary with seven halls and eight shrines 七堂八社. 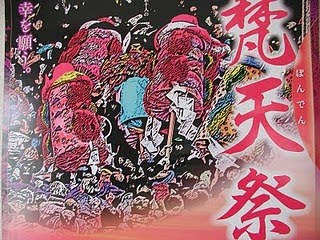 They prayed to the "huge person" as 大梵天 Dai Bonten. BON bedeutet: Ablösung von allen Wünschen und Erlangen eines reinen Herzens. Brachte den erleuchteten Shakyamuni dazu, seine Lehre zu verbreiten. Seit dem 8. Jhd. 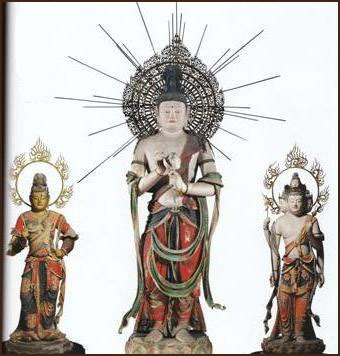 zusammen mit Taishakuten in Japan als Schützer des Buddhismus und des Staates verehrt. Wenn Bonten erzürnt, gerät der Staat in Unordnung und Rebellionen und Epidemien verbreiten sich, das Wetter wird schlecht und Blumen und Bäume vertrocknen. Nimmt die höchste Stelle innerhalb der Ten ein. Bruder des Nioo; oft zusammen mit Taishaku abgebildet. Hoher Haarknoten. Vier Köpfe, drei an den Seiten und einen über dem Hauptgesicht. Jedes Gesicht hat drei Augen. Gewand mit langen Ärmeln über einer chinesischen Rüstung; wenn mit Taishakuten zusammen, trägt Bonten keine Rüstung. Im esoterischen Buddhismus mit vier Köpfen und vier Armen, auf einem Lotussockel auf einer Gans reitend. Hält Stab der Lehre, Lotusblüte und Wedel in den Händen. The old reading for BONTEN 梵天 .. HOTE　ほて .. might has then developed with the Chinese characters it is written nowadays. The grass Bonten effigy was called "kusa Bonten" 草梵天. Dear Dr. Gabi Greve, Gabi Greve sensei, thank you very much for everything! You have by far more learning about the cultures of Japan than we Japanese. And I hope that you love things Japanese. 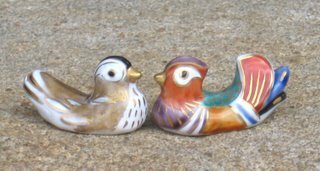 By the way, my family crest is 'The Two Wild Geese in perfect tune'. I sincerely hope that you'll continue learning and tell us about what we Japanese haven't recognized around us. (03)on my blog 'AKITAHAIKU' on January 26.
you are most welcome to do it. Greetings to the Akita Haiku Friends.